Having spent most of my hobby years painting (rather than gaming), I have been lacking in terrain pieces. My troops need a defensive barrier, so I designed a wattle fence enclosure. The base is a piece of hardboard. The vertical posts are toothpicks. For stability I drilled a hole for each post. I then spent over an hour weaving wire through the posts to represent the wattles. Grass grows on the outside. Naturally, none appears on the inside, as the animals would eat it! Wattle as a building material was common from the Bronze Age (or earlier) to Medieval times. I had intended to model the fence for 28mm figures only... but I messed up the height. 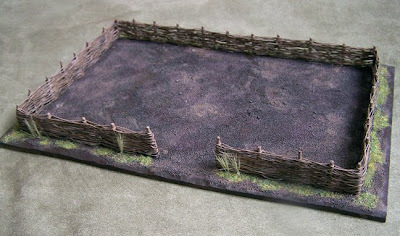 The result is a fence that looks great with my 1/72 models and is just barely high enough for 28mm. See the 1/72 archers and 28mm farmer for scale. Wattle and Daub, by Paula Sunshine. I like what you've done here with the wattle fence. They look so good when painted up and finished. I bought a few before from the company 'All Terrain', but I need loads more, I have to give it a go. Thanks! They aren't difficult, but winding all the wire through the posts takes forever! This is crazy insane. 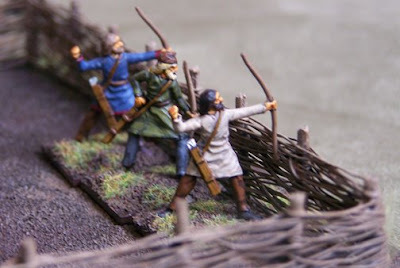 My wife did a small wattle fence encosure for my 15mm celts back when I had them and that was crazy enough. You are a pateitn man, that much si clear. Yes, very patient. I find this kind of work relaxing, rather than tedious. Just wait until I post photos of my Roman watch tower. I spent 4+ hours on the wooden railing alone.